24 FAD C/O 56 APO Notification 2018 for Recruiting 125 vacancies of Tradesman Mate, LDC, Fireman, Material Assistant has been released. All qualified, as well as Interested prospects, can Apply Offline. Additional Detailed Info Pertaining to Educational Qualifications, Age Restriction, Selection Procedure, Test Pattern, Syllabus for 24 Field Ammunition Depot, C/O 56 APO (24 FAD C/O 56 APO) Recruitment 2018-19 Tradesman Mate, LDC, Fireman, Material Assistant Exam showed in this article is pointed out below. 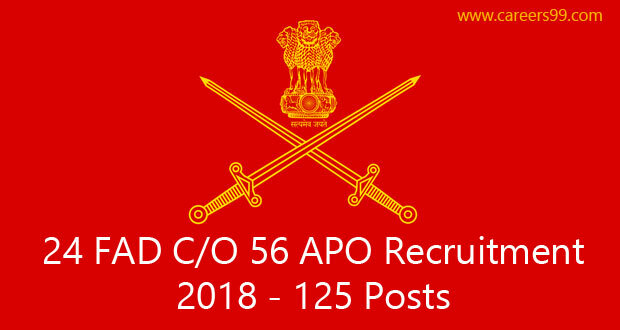 24 Field Ammunition Depot, C/O 56 APO (24 FAD C/O 56 APO) has released 24 FAD C/O 56 APO Recruitment Notification-2018 for the post of 125 vacancies for the posts of Tradesman Mate, LDC, Fireman, Material Assistant. The Recruitment has complete details about their notification on its official website i.e., indianarmy.nic.in and www.careers99.com. This is a good news for those who are waiting for Central Govt Jobs. Candidates may apply offline before the Last date of the Notification i.e., 14/02/2018. And the remaining details for the recruitment like Educational Qualifications, Eligibility criteria, Age limit, No of vacancies, Post names, Pay scale, Job location, Application fee, Important links, Procedure to Apply are mentioned below. Interested candidates those want to apply for 24 FAD C/O 56 APO Tradesman Mate, LDC, Fireman, Material Assistant posts must having following educational qualifications. The age of the Candidates age limit should be between 18 to 25 years for UR/ General category candidates as on closing date for receipt of the application, Upper age relaxation as per govt rules. Interested and Eligible may submit their application on prescribed format along with Attested copies of Education qualification Certificate, Date of Birth Certificate, Caste Certificate where applicable, Self addressed envelope affixing postal stamps of Rs. 25/-, Two Passport size photographs duly attested by Gazetted Officer, one on right corner of application and one on Acknowledgement Card, superscribe the words “APPLICATION FOR THE POST OF ………” on the top of envelope to the 24 Field Ammunition Depot, PIN – 909427, C/o 56 APO with in 21 days from the date of publication of the advertisement in the Employment News.Assam, Meghalaya, Arunachal Pradesh, Mizoram, Sikkim, Laddakh, Sub Division of Jammu and Kashmir State, Lahaul & Spiti District of Pangi Sub Division of Chamba District of Himachal Pradesh, Addaman & Nicobar Islands & Lakshadeep last date for receipt of application shall be 28 days from the date of publication of advertisement. or Click on the below to Apply links. Last Date for Submission of Application for Remote Areas: within 28 days from the date of advt.